petepaulos wrote: 1. Would it be better to offer a separate subtitle file, or embed the caption file in the video download? This location is just an example, and the download could appear in a different location. User "paulw" brought to my attention this forum post and I'd like to get things rolling quickly. A bit of a warning, adding a separate subtitle file to all our media would take just a couple weeks, however embedding caption files into the video downloads for all our media may take several years. We're here to serve our users as best as we can, and your feedback will really help get things moving! 1) If there is a way to embed them with good compatibility for all the media library videos then that would be ideal. So have embedded subtitles for all the media library files then just have separate subtitle files for general conference sessions, broadcasts and training videos. 2) For the general conference/broadcast/training videos - XML and SUB or SRT would be great. XML allows for easy conversion into other formats, and SUB/SRT tend to work well with media players like VLC etc. 3) Only a small proportion of users will be using them so I don't think they need to be displayed prominently (ie. on the General Conference page on LDS.org) but just somewhere either in the Media Library or somewhere on LDS.org where those who need them can find them would be terrific. Following-up to see if there are any further developments on offline mp4 file closed captioning options. niederhausern wrote: Following-up to see if there are any further developments on offline mp4 file closed captioning options. Unfortunately there haven't been any official developments that have been announced. But if you do a Google search for "LDS General Conference Subtitles" some unofficial guides and resources have been posted that may be of help. for showing at our stake meeting. But now they have disappeared too. Why would subtitles be uploaded for the first session then removed? I tried to submit Feedback through the LDS.org website but submission results in a "Internal Server Error". This whole subtitle situation is getting quite old and frustrating. 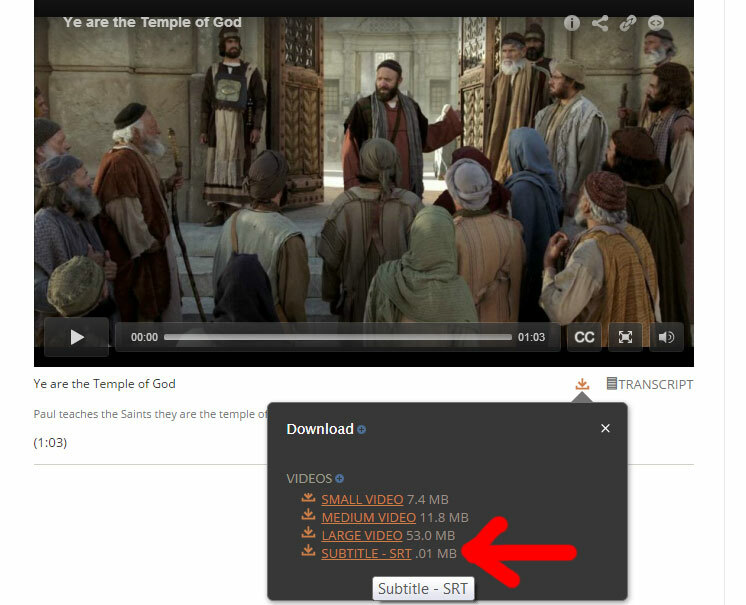 jcrosbie wrote: Usually closed captions/subtitles are added to the "Watch" (Brightcove viewer) feature on LDS.org for sessions by now but they don't seem to be there. It seems to be there for the individual talks, just not for the whole session. That seems to be true of the YouTube videos as well. i am trying to access the subtitles for the new ministering training videos so that we can download them and show them without streaming. Anyone who could help? conbward wrote: i am trying to access the subtitles for the new ministering training videos so that we can download them and show them without streaming. Anyone who could help? I'm not able to access subtitles even viewing on the web page. I can get to the settings, but I can't turn them on. I'm not sure if there are any captions. Just rename the file to match your .mp4 video file for that session, place in the same directory and then play the video file with VLC and it should play with subtitles. Is there any update on the subtitles/closed captioning being updated for April 2019 General Conference videos on the browser/Brightcove player on the church website? Congregations around the world will begin watching conference tomorrow, and I'm sure like our stake - will have many hearing impaired people that require subtitles. They usually have gone up within a few days for previous conferences?